Crown- the top part of the tooth, and the only part you can normally see. 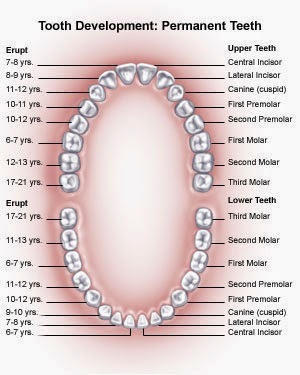 The shape of the crown determines the tooth's function. For example, front teeth are sharp and chisel-shaped for cutting, while molars have flat surfaces for grinding. Gumline- where the tooth and the gums meet. 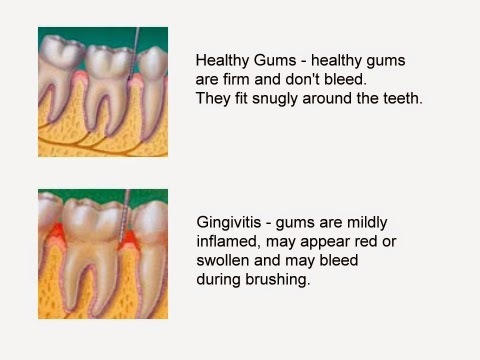 Without proper brushing and flossing, plaque and tartar can build up at the gumline, leading to gingivitis and gum disease. Root- the part of the tooth that is embedded in bone. 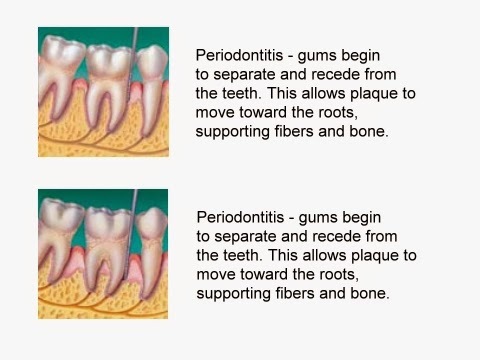 The root makes up about two-thirds of the tooth and holds the tooth in place. Enamel- the outermost layer of the tooth. Enamel is the hardest, most mineralized tissue in the body - yet it can be damaged by decay if teeth are not cared for properly. 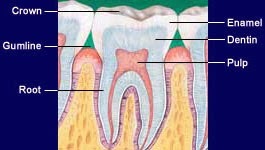 Dentin- the layer of the tooth under the enamel. If decay is able to progress its way through the enamel, it next attacks the dentin ó where millions of tiny tubes lead directly to the dental pulp. Pulp- the soft tissue found in the center of all teeth, where the nerve tissue and blood vessels are. If tooth decay reaches the pulp, you usually feel pain. Incisors- the sharp, chisel-shaped front teeth (four upper, four lower) used for cutting food. Canines- sometimes called cuspids, these teeth are shaped like points (cusps) and are used for tearing food. Premolars- these teeth have two pointed cusps on their biting surface and are sometimes referred to as bicuspids. The premolars are for crushing and tearing.